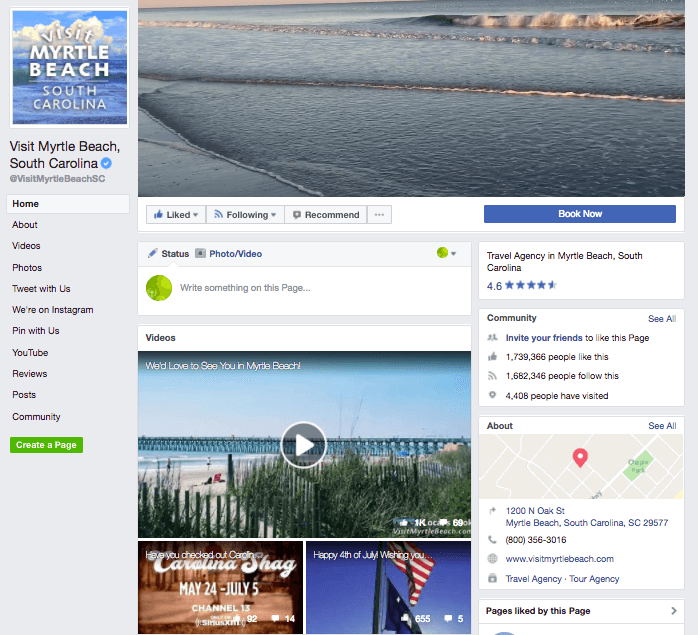 Video—Their cover photo is a video of beautiful waves rolling in on the beach, and they also use video effectively to showcase things to do and see around town. Giveaways and Sweepstakes—The page offers regular opportunities for followers to win fun prizes (like a 4-night paid vacation) by sharing photos of their stay. #MyrtleBeachMemoriesMonday—Guests can use this hashtag to share photos every Monday. It’s a great way to encourage engagement from fans while also showcasing the attractions of the area. On Page CTA—At the top of the page, the “Book Now” button takes visitors straight to the booking page on the website—no extra steps needed. Video—This is another great video header that showcases awesome activities visitors can explore in the area. They also regularly post videos of area attractions in their newsfeed. Event and Activity Highlights—The top of the page showcases upcoming events, and regular posts keep visitors up to date on area happenings. 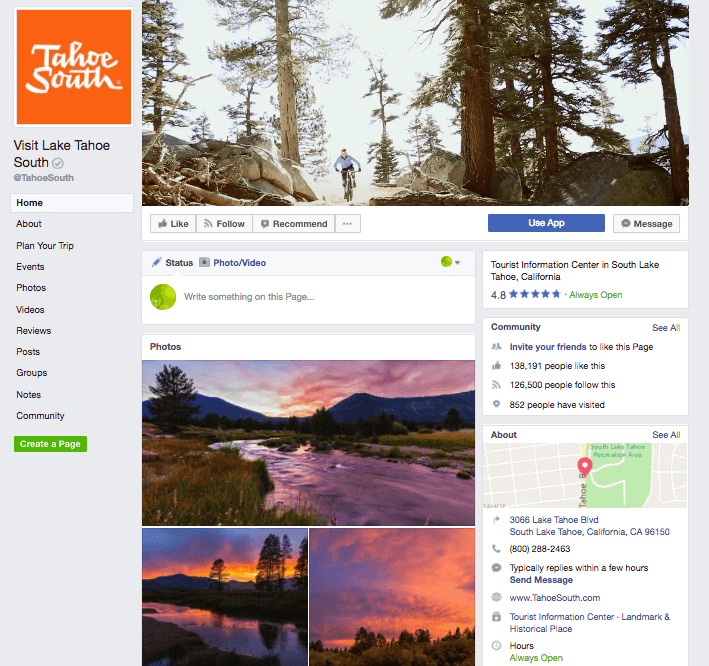 #TahoeSouth Instagram—The page points visitors to their Instagram feed with posts highlighting their 10 favorite Instagram photos each month. Gorgeous photos—Starting with the header and continuing through the newsfeed, this page gives visitors plenty of eye candy to spark the imagination. Videos—They also use video effectively to showcase sightseeing attractions, foodie destinations, and activities. State Destinations and Events—Follow this page and you’ll never miss out on must-see destinations and events like the Lodi Grape Festival or the infamous Alcatraz. #CaliforniaWild—Here’s another excellent use of hashtags to engage the audience. #CaliforniaWild follows four women on their journey through lesser known, but breathtakingly beautiful regions of the state. Facebook Live videos—This page uses Facebook Live to showcase everything from festivals and events to dogs playing on the beach. 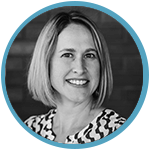 It’s a perfect opportunity to invite user interactions and answer questions from viewers. 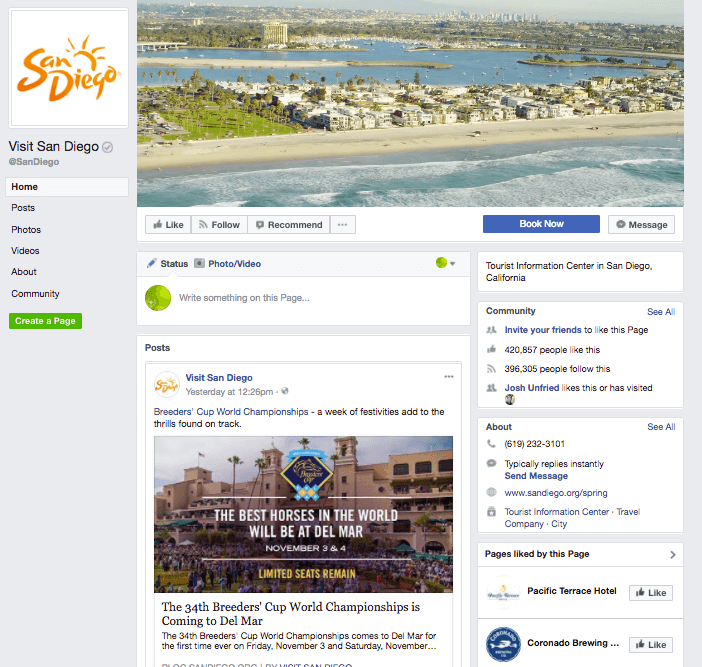 User Generated Content—Fans can share their videos and photos on the page or use the hashtag #visitSD to tag content. 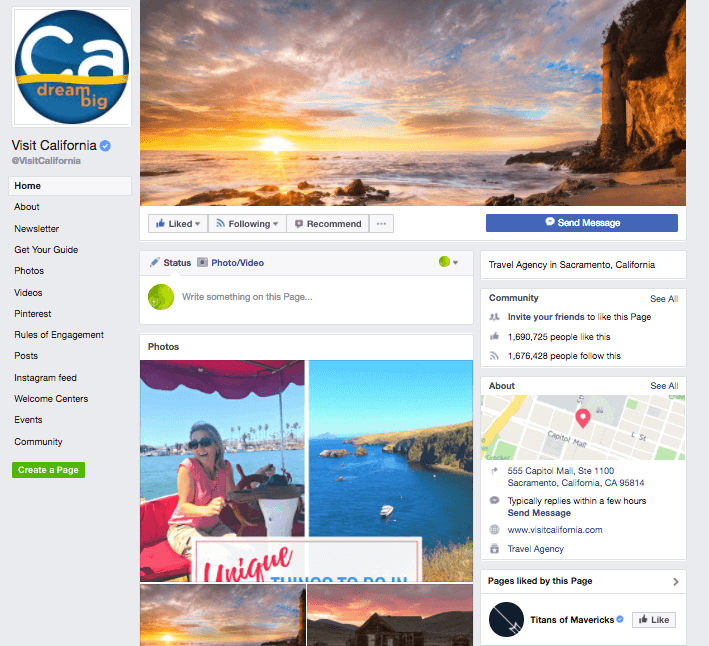 On-Page CTA—This page also makes good use of Facebook’s on-page CTA feature to invite visitors to book their vacation immediately. It should be easy to market Hawaii, right? Still, Go Hawaii does a fantastic job of showing off the beauty and seduction of the islands for their 2,308,044 fans. Dining Highlights—Mouthwatering images of local fare helps visitors know how to plan their foodie adventures. Photos of Scenic Views—Everyone goes to Hawaii for the scenery, and this page doesn’t disappoint. From beautiful beaches to local events, these images will have you packing your suitcase in no time flat. 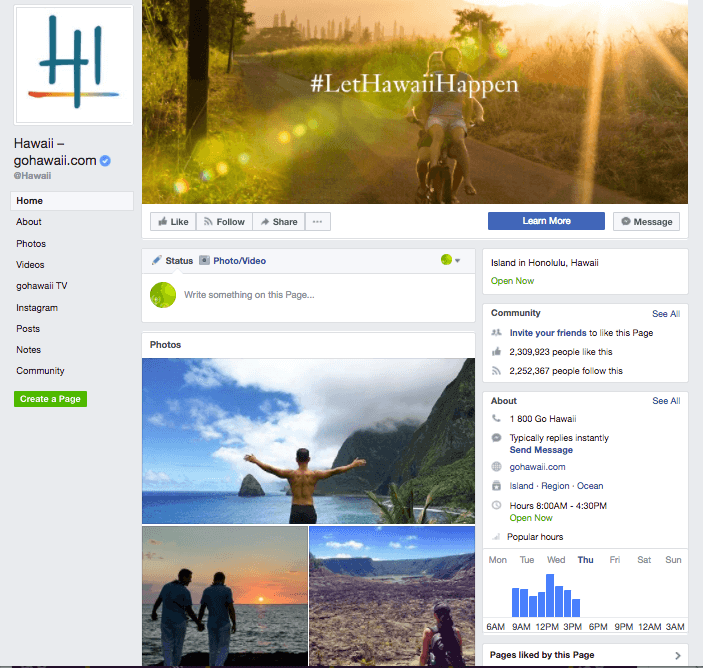 #LetHawaiiHappen—Here’s another hashtag that helps visitors find and share content on the page or on their own newsfeeds. Things to Do—Hawaii is more than beautiful beaches, and Go Hawaii showcases the breadth of experiences with interactive maps, event features, weekend adventure ideas, and photos of places to visit. These travel brands are rocking their travel Facebook marketing strategy--now it’s your turn! What ideas or content have you used to draw visitors in and inspire them? Let us know in the comments!